I had stopped feeling joy. That was the first sign for me that something needed to change– that something was wrong and that I didn’t know how to fix it. Things were happening in my life that should have been getting me excited, that should have been touching my heart, that should have sent me reaching for my camera or my journal or someone’s hand- to squeeze it and to say, “this is it”- but instead, I just felt kind of numb and very, very tired. I was starting to not care about any of it. That detachment terrified me. I wonder where you are at today. Where are you at in terms of joy, freedom and contentment? I look around, and I know I am not alone in what I’ve been feeling. So many of us have been placing our hope in all sorts of things that have frankly not delivered. We were raised being told that we can be anyone we want to be, that there is nothing out of reach, that we can have it all. So we’ve been trying. Really, really hard. We’re trying to live out that promise where we can have a solid marriage, raise good kids, pursue our passions, and push through the glass ceiling. We’ve not just been promised that we can do it, we’ve been told that when we get there, it’ll all be worth it. Is it? I’m not so sure. This reality made me feel really scared that I was missing my life. In the midst of the whirlwind, I determined that somehow, I was going to find it again. And once I found it, I was going to live it. After a couple of years of deep soul work, I have found that there is another way. There is a different path. There is some new territory that’s a little uncharted, but at the same time is an adventure that can bring the change that we are after. Fearless and Free, a six-week Bible study on the book of Ephesians, is the result of that journey. It contains my most personal writing, and offering it to you feels a bit like handing you my heart. I don’t like to feel that vulnerable and exposed, to be honest. 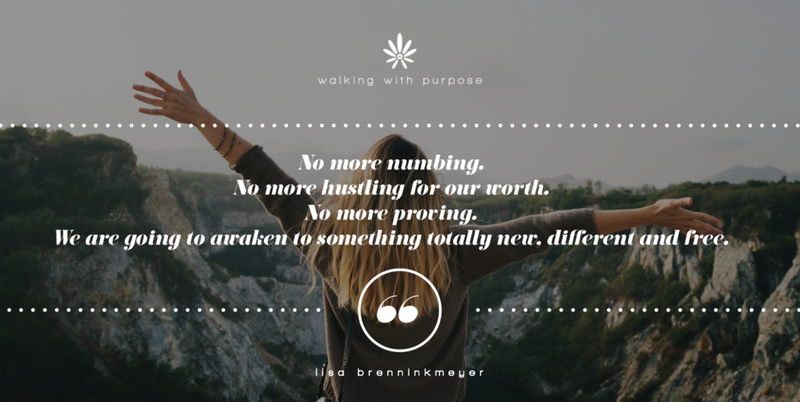 But I believe it is time for us to face our brokenness and need for inner healing, and I know that it can be scary to peel back the layers around our hearts. So I offer you my brokenness, my honesty, and the truth that I have found to be life-giving and transforming. I offer you my hand on this journey, with the steady assurance that you are not alone. Fearless and Free leads us on a three-part excursion: the Wakening, the Wrestling and the Warrior. In the Wakening, we’ll wake up to the reality of who we are in Christ. Our true identity has been stolen and messed with, and we need to get it back in order to walk in freedom. Once we have it clear in our heads, we need to live out of that reality. In the Wrestling, we’ll learn to “Be renewed in the Spirit of our minds and clothe ourselves with the new self” (Eph. 2:23-24). This is talking about a totally different mindset. A completely different way to think and deal with our emotions. It’s the part of the journey where we learn to recognize our Father’s voice. We’ll become strengthened from within, as we learn to wield the tools and weapons that have been at our disposal all along. In the Warrior, we are going to recognize that we are in a battle. It’s a battle for our hearts. It’s a war on our freedom. And by God’s grace- that unearned, unmerited favor and strength- we are going to take back what the enemy has stolen from us. We are going to allow our loving Father access to our hearts. We’re going to experience healing, and joy, and the high of being fully alive. No more hustling for our worth. We are going to awaken to something totally new, different and free. P.S. To hear more about Fearless and Free, ask questions and get tips for using it in a small group or parish setting, please join me on Instagram Live 5/3/18 at 10am and Facebook Live 5/4/18 at 10am. I’ll also be posting Instastories all week with Fearless and Free sneak peeks!